Neatly illustrated by an overbuilt 6-lane parkway with each car type in its own lane. It’s really odd how the driverless car people, proposing such a forward-looking technology, seem to be stuck way in the past in how we might like our cities to work. And while the article claims that “HERE is obviously not suggesting that driverless car profiles will or should compromise safety to any extent. That’s priority number one.” I don’t doubt that once people realize the cars can be programmed to drive the way they like, some will program them to drive as aggressively as legally permitted. @jonawebb once people realize the cars can be programmed to drive the way they like, some will program them to drive as aggressively as legally permitted. I’m guessing the cars will have a manual override. 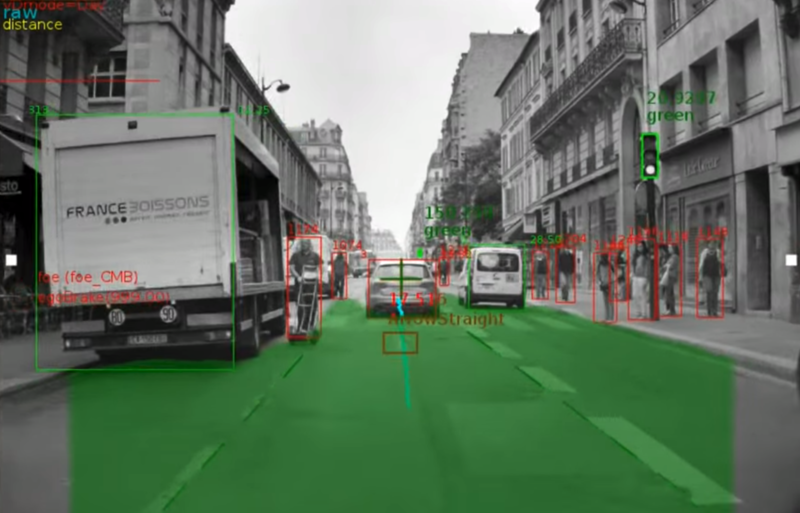 If the majority of cars are computerized – that is, driving both legally and predictably – you will see some serious jackass behavior that is currently being held in check becasue other drivers are not all that predictable. People talk about how reckless driverswill risk a life to save a minute or two. But if you watch a reckless driver on teh freeway until he is , say a quarter mile away from you, you will generally see him tailgate or cut off 3 or 4 people. To save 15 seconds. So, the reality is that some drivers are willing to risk a life to save 4 or 5 seconds. Turns out if you want the pedestrian detection feature you have to pay for it; who knew? Might be entertaining to see some of the jaywalkers who don’t even bother to look up from their phones when they cross against traffic get hit, in all honesty. Computerized navigation systems will never be completely safe for something as complex as driving in traffic. Glitches happen all the time. A program has to be written by a human who, even if he does not make a mistake in the code per se, still can never foresee every possible contingency. Any system that approaches “completely safe” will be mind-numbingly passive. Engineers will have to accept some level of risk in order to make a system that transports people efficiently. Just like they essentially have to make cars less safe in order to meet demands for more fuel-efficient vehicles. Also, I’m pretty sure Pittsburgh’s street system will completely confound vehicles tested in planned cities. It’s probable that the public will accept a system that it feels is comparable to a human driver in terms of safety (i.e. actually far safer than a human driver in most situations). Just keep treating the large metal boxes as if they’re piloted by distracted, hairless monkey corpses reanimated by coffee, and you should be fine. Just keep treating the large metal boxes as if they’re piloted by distracted, hairless monkey corpses reanimated by coffee, and you should be fine. Thanks. I appreciate the occasional reminder that motorists are just like me. Well then, if uber is testing their tech in pittsburgh, they may have the most advanced system out of all of them. If they don’t, they probably will, shortly. I honestly don’t think safety OF OTHERS will be much of a factor in terms of people buying the systems. When has safety of others ever been a major factor in car sales in this country? People buy cars because they are fast, good-looking, have features like audio systems, lots of seats or storage space, keep THEM safe (i.e., big, hulking SUVs, or Volvos, with lots of metal to protect the drivers and passengers), (maybe) save gas. They don’t buy them to keep them from hurting or killing people or causing property damage. It’s simply not a factor — people don’t even want to think about it. In all the marketing level discussion in the media I’ve seen about driverless cars I’ve never seen anything that says “this car will be in fewer crashes than other cars.” It’s always about convenience, or (maybe) saving gas. Not a word about not hitting other people. I know this is a concern for researchers; papers are being written about it. But if people aren’t buying cars on that basis, how much of an issue will it be when the cars are actually being sold? Do you expect car manufacturers to include features that people don’t care about, when they might slow cars down, which is definitely something people care about? It think it will depend whether people will own the cars and think of them as theirs or whether it will be more of a taxi service. The fully autonomous folks are trying for the latter. If it’s the latter, it seems like it’s either a service that is either good for the people of a city or not, taken as a whole. People who don’t write complex algorithms generally don’t empathize with the confounding nature of the problems they face. So that blunts the “hey we’ve all been there when some %^&* cyclist or oblivious pedestrian jumps out” reaction, the default motorist pity party in these cases and hopefully allows us to set the bar much, much higher. @byogman, I wonder if they’ll require the driverless car service to have the same high standards and respect for other road users that taxi drivers do when they provide their service? We hear the car before we see it. A car roaring up a winding mountain road. Aerial shot of the car. It is turning at the switchbacks, expertly downshifting to maintain control as it goes around the turns. It roars up to the top of the hill, briefly leaving the road as it reaches the top. Ten feet ahead are some bicyclists, taking up half the road. You hear a couple of brief honks, as the car veers to the other lane and passes the cyclists with inches to spare. They look agog, amazed at the speed as it rushes past. We are inside the car. A young girl is sitting on the leather front seat, working on her homework. The sound system is playing a children’s song. Not a sound from the outside. A jaywalker is crossing the street, not paying attention. The car rushes past, blowing the hair back from his face, so you can see his eyes. He doesn’t even notice, reading his cellphone. The car signals right, slows to turn, then we see a garbage truck blocking the street. The car stops signalling right, signals left, makes a three point turn in a driveway, goes back the other way. Passes the jaywalker again, blowing his hair back. The car turns left, slows. The girl finishes her homework, looks up, slight concern crosses her face. The car drives slowly past a police car — the policeman looks up, nods approvingly. The car pulls up in front of a school. The girl gets out, leaving the door open, starts to walk away. The car beeps once, the girl looks back. She’s left her bento box on the front seat. She comes back to get it — the car is completely empty. The girl runs to the school — she’s the last one in. Just made it. Camera returns to the car. Car door closes by itself, locks. The car drives off. I am sure that is Google’s present intent. @jonaweb I am sure that is Google’s present intent. If you’re driving a car, you’re looking at billboards. Google doesn’t own billboards. If the car is driving, you’re free to surf the web and enjoy Google’s fine advertising. If you’re driving, but surfing the web anyway, it’s still bad for Google, since your revenue-generating surfing time would be reduced by any visit to the hospital, jail or grave. The tracking stuff is just an added bonus for them. I think this article is a little unfair; the simulation not including bikes or peds doesn’t mean the researchers are ignoring them. They’re at MIT, which is in a big biking city. Though it’s impossible to imagine walking or biking in a city with intersections that work the way the one in the simulation does. I cant do track stands, but I’ve noticed that real-people drivers can get confused by them too. I mostly notice this happening at stop signs where the car has the right of way but is afraid to take it because although the bike is stopped it somehow freaks them out. When track standing or just stopped at an intersection where I don’t want to raise my hands, when a car has the right of way I usually do a head nod and people seem to get that I’m letting them go. Not sure if driverless cars will be as apt to take my signal. To me, this shows the problem with driverless cars; driving is a competitive, social activity. If you knew another driver would always yield to you, you would act more aggressively towards that driver, so you could get ahead — or some drivers would. So the driverless car ends up getting slowed down because other drivers will take advantage of its programming, knowing that they can always go first. This could lead to driverless cars getting stuck pretty much indefinitely in heavy traffic conditions, say where two lanes of heavy traffic merge into one. I guess the driverless cars will end up being programmed to be more aggressive to deal with this, but then, why not program them to be more aggressive always? You’d get where you’re going faster. Those computer people already have a well-tested solution in hand… now if we can get those humans to cooperate. Exponential back-off would work great for the human drivers; not so great for anyone trying to get someplace in a driverless vehicle. In my very first programming job, or after I got fired, actually, I wrote a command-line processor for TSO (Time Sharing Option). This was on an IBM 360/65, actually, the only computer for the campus. You’d sit at these modified Selectric typewriters, type in your commands, and then get output. My command-line processor allowed you to submit more than one command (job) at the same time. So you’d always be using the CPU. Which had a similar scheduling algorithm; it was assumed that TSO jobs were short, so it would give you another time slot if yours didn’t finish. The end result was, people using my command-line processor could walk in at the busiest time of the day, fire it up, and start typing away. Their commands would get processed immediately, while everyone else’s Selectrics would lock up. Even the operator station requesting tape mounts would lock up. You had the computer all to yourself. And then you’d finish, log off, and everyone else’s TSO station would start working again. Awesome. Imagine a driverless car getting off the Parkway at the Oakland exit. It waits for someone on Bates St to give it a chance, but everyone’s in a hurry. So it waits, then waits some more, then just keeps waiting. Until traffic on Bates clears, say an hour later. Wistful memory: I was seated at exactly one of those Selectrics at 10:10 a.m. on Oct 25 1980 when this girl in a pink sweater turned around from her terminal to ask me, “Do you know any Fortran?” I think that pink sweater is still around, 35 years later, but I’m pretty sure the Selectric is not. Ooooh, hoity-toity Selectrics, probably with lowercase letters and everything. My high school had an ASR-33 teletype, wired up to an HP 2000F at another high school. No lower case letters for us (and I recall the girls were pretty scarce too). It’s interesting how this thread has evolved. It’s about CARless drivers = bikers…not driverless cars or careless drivers…. Paper tape, oh yes, though sadly I don’t have any of my programs saved in that format anymore. Paper tape had the great advantage that you could make long but very narrow banners with it. And it’s Hedley, um, or rather, Hedy. Somewhat more back on topic, the Uber “endgame”: privatized public transit. http://www.theawl.com/2015/08/ubiquity. Sounds sort of bad to a liberal but I’d be happy with any better solution to the problem of moving people around in the cities. Requiring all people who have means to buy and maintain personal cars, while leaving second-rate shared vehicles for those who can’t afford them, or don’t want to, doesn’t work very well. Europe has a much better system based on shared vehicles but is also geographically more dense, making it more practical, and has a tradition of government being more involved with people’s lives. The second order effect happens when other motorists figure out the driverless cars are all pussies, and will back down when push comes to shove. So they’ll end up getting pushed aside on the road. One of the things that keeps drivers behaving is the possibility that the other driver is a complete maniac who will not hesitate to bump you if he feels challenged. The last two are linked. Pussies are moral in the here and now, which is the edge on which people live and die. We really need to make an environment that allows them to make forward progress or nobody will want to ride. The way that doesn’t invite rampant abuse by assholes, is by using the sensing and recording equipment in the car and allowing those recordings to be considered as proper evidence. Send the timeslice in, blamo, ticket in the mail. Which is uncomfortable, because it’s giving authorities, who can really be pricks, a lot of power. This is feeling way too much like the end of the south park movie. I think we could solve many problems by programming cars to kill their drivers when appropriate. Even without self-driving cars. That thought, however unrealistic, brightens up my rainy morning! I particularly enjoyed the story about the Dutch driver who managed to defeat the safety systems intended to keep a person in the driver’s seat with their hands on the steering wheel and post a video on the web of riding in the back seat while the car drives itself. Google self-driving car pulled over for driving too slow, impeding traffic. 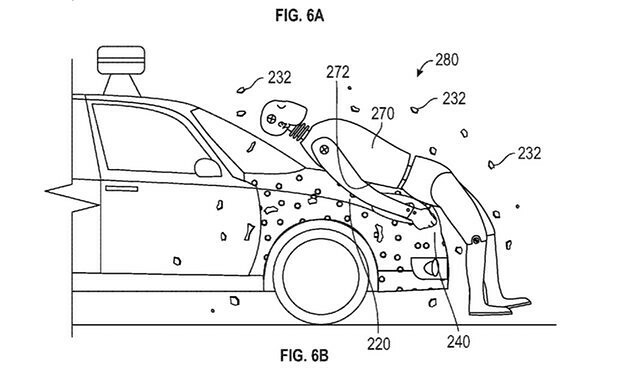 The patent, which was granted on 17 May, is for a sticky adhesive layer on the front end of a vehicle, which would aim to reduce the damage caused when a pedestrian hit by a car is flung into other vehicles or scenery. Why not instead make the car’s air bag sticky, so that it stays stuck to the face of the driver for the rest of their life?